Last year, I thought my manga project was going to be the weirdest freelance project to come across my desk. Clearly, I didn't figure on the undead. A new project has me huddled over a library table strewn with books like, The Complete Vampire Companion: Legend and Lore of the Living Dead, Bunnicula, Twilight, Vampire Bats, and The Vampire in Legend and Fact. To make matters weirder, when I started a new file folder for this project, I whimsically chose a red one. So, there I am scribbling notes from my books with my red folder and me in a red sweater. (That last was totally unintentional, I swear.) A fellow library patron totally boggled as he passed by me. Aside from the fact that I find the subject matter utterly fascinating and is now directly responsible for my love-hate obsession with Stephenie Meyer's Twilight series, portions of the research make me giggle. For instance, this is what I learned today from The Complete Vampire Companion on the subject of Gypsy vampire prevention. 3. The writer of this 1994 book opines that Frank Langella -- seen most recently playing sweaty-faced ex-prez in Frost/Nixon -- was "perhaps the sultriest Count Dracula" when he played Stoker's vampire in 1979. Clearly, that was before the the world granted us the undead forms of David Boreanaz as Angel and Robert Pattison in Twilight. 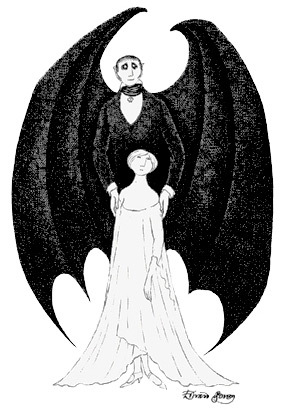 In my readings about vampire bats -- cute and cuddly creatures, they truly are! -- I learned that Charles Darwin was the first scientist to see a vampire bat during his sojourn on the H.M.S. Beagle. Considering that my mother was frequently called upon to humanely rid our neighbors' attics of bats, and that grandmother appeared in a non-speaking role in Bela Lugosi's Dracula, I think I'm eminently qualified to take on this project.